Sugar-coated pecans add the finishing touch to this satisfying winter salad recipe. 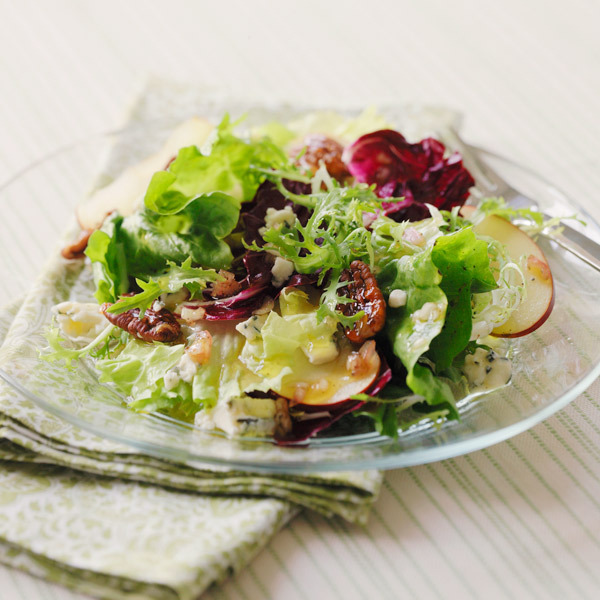 Hearty winter greens—escarole, radicchio and frisée—are combined with crunchy red apple wedges and crumbled blue cheese and then topped with a simple olive-oil vinaigrette salad dressing to create the ultimate cold-weather comfort food. In small skillet, heat 1 teaspoon oil over low heat. Add pecans and sugar, and cook, stirring, until sugar melts and turns amber, and pecans are crisp and coated, about 5 minutes. Transfer to bowl. Sprinkle with ¼ teaspoon of salt. In large bowl, whisk together vinegar, remaining ¼ cup oil, shallot, remaining ½ teaspoon salt and pepper. Add escarole, radicchio, frisée and apples. Toss well. Top with cheese and pecans.